The solution is simple to enable Server 2016 Virtualization on Windows 10, easy enable or disable via Apps and Features! 1.) ... Enable Hyper-V on Windows 10 / Server 2016! 2.) ... Info about using of Hyper V virtualization! See also: ► ... After updating Win-10 no space on the disk, what now? 1.) Enable or Disable Hyper-V virtualization on Windows! Please via Windows-X menu entry Apps and Features! However, you can call the window directly via Windows + R keyboard shortcuts and the appwiz.cpl command. (Image-1) Hyper-V Virtualization on Windows 10 or Server 2016! Hyper-V the virtualization under Windows 10 and Server 2016 is a fine story here you can virtually run different Windows and Mac, Linux operating systems under Windows and off, or under Windows 10 (Redstone 4 & 5), 8.1, 8, 7: Pro, Home, Enterprise, Basic, Premium, Professional, Starter, Ultimate, Windows-Server 2016, 2012, 2008 available and can be used to virtualize various operating systems, which is very useful if you want to do various tests under different operating systems, or the behavior simply without dangers wants to test with the help of virtualization. 2.) What should I consider when using Hyper V virtualization! If you enable Hyper-V virtualization on Windows 10 and / or Server 2016, other virtualization tools will not work, such as Virtual Box from Oracel Systems. So activate only if you do not want to use other virtualization under Windows 10 and / or Server 2016. 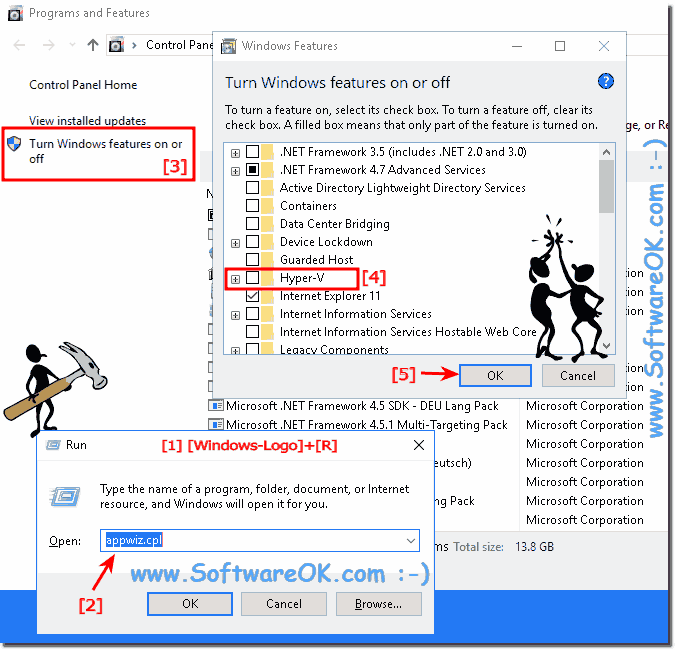 For example if you have it randomly and unconsciously disabled a function, or the virtualization, or Hyper-V is not working properly, then you can just disable this virtualization function and then reactivate! This usually leads to the full function of Hyper-V.